The Army on Tuesday censured a retired three-star general for the chain of errors that followed the friendly-fire death in 2004 of Army Ranger Pat Tillman. Army Secretary Pete Geren told a Pentagon news conference that Kensinger was "guilty of deception" and had deceived investigators. "It's a perfect storm of mistakes, misjudgments and a failure of leadership," said Geren in announcing his decision after an investigation into the death of the former pro football player. 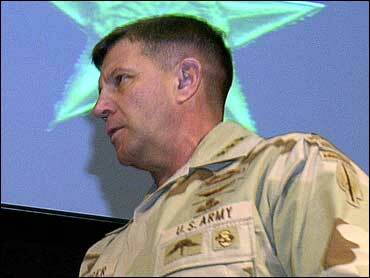 Kensinger headed Army special operations. The general bore the brunt of the punishment. Nine other officers were criticized but not punished. The panel will decide whether Kensinger should be stripped of his third star. Kensinger denies he lied to investigators, but the Army is likely to demote him, which would cost him $900 a month in retirement pay, reports CBS News national security correspondent David Martin. Geren said he considered recommending a court-martial but ruled it out. "I looked at many factors," he said. Kensinger, he said, "compromised his duty." "He failed to provide proper leadership to the soldiers under his administrative control. ... He let his soldiers down," Geren said. "General Kensinger was the captain of that ship, and his ship ran aground." Geren said that investigations have conclusively shown that accidental fire from U.S. troops was responsible for the death in Afghanistan of Tillman, who had walked away from a $3.6 million pro football contract to become an Army Ranger. The Army initially suggested that Tillman, who was 27, had been killed in a firefight with enemy militia forces. The Army then arranged a ceremony to award Tillman a Silver Star for bravery. Geren said the death "was a tragedy ... this was an accident." The Army says Tillman still deserves the Silver Star because he was rushing to aid his fellow soldiers, but that medal now comes with an apology for compounding the family's grief, reports Martin. Geren said he could understand how the Tillman family and other Americans might reach the conclusion that there was a cover-up. "The facts just don't support this conclusion," he said. "There was no cover-up." Still, he said, "We have made mistakes over and over and over, an incredible number of mistakes in handling this. We have destroyed our credibility in their eyes as well as in the eyes of others." Geren cited "multiple actions on the part of multiple soldiers" in compounding the confusion that surrounded the death. "There was never any effort to mislead or hide" or keep embarrassing information from the public, the Army official said. Aside from his decision to censure Kensinger, Geren said that he was accepting recommendations by Gen. William Wallace, who conducted the investigation, for nine other officers. These other officers included Brig. Gen. Gina Farrisee, director of military personnel management at the Pentagon, and Lt. Col. Jeff Bailey, the battalion commander who oversaw Tillman's platoon and played a role in the recommendation for his Silver Star. Both will receive memoranda of concern, Geren said. Escaping any blame was Lt. Gen. Stanley McChrystal, head of the military's Joint Special Operations Command. He oversees the military's most sensitive counterterrorism operations.